Being that I am studying to become a photographer, I find it interesting how involved the fashion industry has become with fashion. I can understand the need to photoshop a “healthy,” model, but I find it excessive when magazines start liquifying (photoshop talk for “skinny”) models who are already 5’10 and 105 lbs. What becomes ridiculous for me is when the industry has this notion of skinny as normal. There has been a lot of talk in previous years that models aren’t skinny enough. Now what we’re seeing is that models want to be plump, they want to become more robust curvaceous woman. The Huffington Post discusses Demi Moore and her cover for W Magazine, where she is seeing wearing a Balmain leotard that has been badly photoshopped from the runway image of Anja Rubik. Moore, a 46 year old actress, replaced with a 26 year old body – seems to me as if that’s a far stretch from reality. What the media is doing with women, taking years off their aging process – creating products, giving them procedures, is a large cry for youth and that tuck everlasting experience. It makes me wonder what women will be doing when our children are our age. Another article where The New York Times discusses magazines and the retouching world. The article explores the photoshop industry and the need for celebrities and models to become more ideal. The NYTimes goes into detail on how the retouchers think, what they do to steer away from the obvious and make it become the subtle. The New York Times discusses the lighter side of retouching, the good if you will. It gives a good reputation for the retouchers of the industry, but it also considers the disruptions on the woman’s self esteem from the retouching images. The video challenges all magazines to publish an issue where the entire month has been natural, no retouches, all positive body images. What would this to to the media? Would it slow it down? What would the average woman say? I am curious to see what would happen and IF this could ever happen. 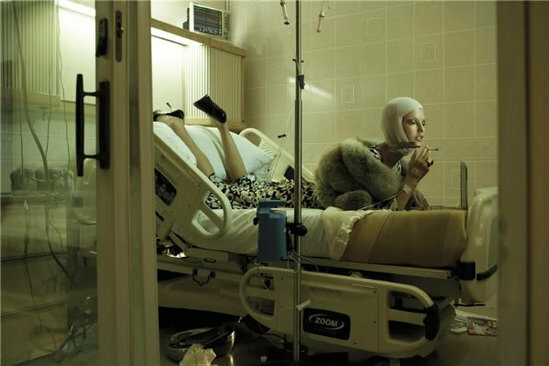 While reading Edmonds “Poor Right To Be Beautiful, Plastic Surgery in Brazil,” I was reminding of the well known spread that elaborated on plastic surgery in the fashion industry: Makeover Madness shot by Steven Meisel for Vogue Italia 2005. The shoot exhibits a female model dressed in fancy clothing looking like she has just had plastic surgery. The shoot touches base on the fashion industry always wanting the female to look perfectly constructed. While the need to be nipped and tucked may not be news worthy to a lot of magazines, it has become a fad and apart of everyday life. Edmond introduces Plastica as a way of life for the Brazilian people. These women are encompassing what Edmond states is the “inferiority complex,” which discusses that plastic surgery has less to do with wanting to look beautiful, but more to do with “Can I get a job if I become more beautiful?” or “Will I be more accepted in the industry that I am already in?” Much like the fashion industry, the women of Brazil are changing their appearance to fix into what society claims is acceptable. The images in the Italian Vogue touch base on the Italian women’s lifestyle and the need to have a face lift and rhinoplasty – but more so for the effect of approving ones appearance. Before when surgeons thought of plastic surgery they assumed it was for vanity, to better ones appearance, now – surgeons believe that plastica is for the beauty within as well. While I agree that appearance on the outside will reflect on how you feel about yourself inside, I do not see how this has changed the minds of surgeons. This brings me to my next example, Extreme Makeover and The Biggest Loser. Reality television shows like these take normal people and make he or she over to become the best version of themselves. Shows like Extreme Makeover take individuals who have tried their best on their own – most of the time lower class working individuals who cannot afford the surgery on their own- and they give them a lift, tuck, nip, but not without them doing something in return. For example, for these people to get a lift and tuck they would need to loose x amount of weight. The individuals on the show are usually ones that cannot get a job because of what they’ve looked like, so their self esteem has been lowered. Edmond elaborates on the idea that plastica is about therapy and less about the appearance for vanity. While reading “Sourcing of Second Hand Clothing,” I immediately thought of the new sustainability fad that has been going on all around New York City and more specifically, our own school, Parsons. The reading reminded me that while different items come from different locations around the world, there are still places and people that make trade possible. For example: there are many organizations happening that are donating objects, clothing, a helping hand to under developed countries: they are giving and getting back. As I stated in a comment below: I was interested in Toms Shoes specifically. The owner of Toms shoes has an organization named “One for One,” which states that for every pair of shoes you buy, a pair is shipped to Argentina. This organization brings me to the next part of the article that I found interesting, when the author states that the supply and demand is becoming stronger based on fashion fads and “looks”. This to me rose attention because Toms “One for One,” has been around for many years now and it is just becoming popular because many people have seen Toms in the magazines and a trend has started. Also, the very trendy and stylish Olsen twins have taken part of Toms shoes and designed a pair that will also be sold and donated for children in Argentina. When the author is discussing second hand clothing in well established charities in relation to how much clothing is actually kept and what is rejected I was reminded of a time that I dropped of quite a few items at a Salvation Army in Maryland. From what I understand, when you drop off items at a place like Goodwill or Salvation Army, you are receiving a Tax Return paper or something of the sort. This brings me back to my point of giving and getting back. You are letting go of the items you no longer want, but these places are taking in items they feel are acceptable. But what makes these items acceptable? Are they trends? Or is it merrily based on what is wearable? This also brings me to the point of whats one mans trash is another mans treasure. I believe that this article expresses the prolonged life of clothing and addresses how we can do so and what the charitable organizations are doing to help out. It’s the smaller organzations that often help the most, say for instance the people who are going to Haiti to help give objects to the families in need – we can help someone else by giving our used items or even new items that we have not used, and relinquish what we no longer need. Get rid of the clutter and recycle and reuse! When I walked into the newly constructed Madewell there was an overall feeling of old combined with new. Once the customer has entered the store they get a sense of past influencing their present. The store showcases vintage style, old photography, outdated textures, and warmth. This overwhelming sense of reminiscence was brought on by the images on the wall, the hardwood floors, the collection of vintage cameras alongside vintage lamps and well made leather pocketbooks. The store, Madewell, has cozy feeling – much like it’s competitors Anthropologie and Free People. The merchants in the store were welcoming and very persuasive. The girls in the store were wearing clothing from the store – they embodied a 1940’s laidback easy going girl. 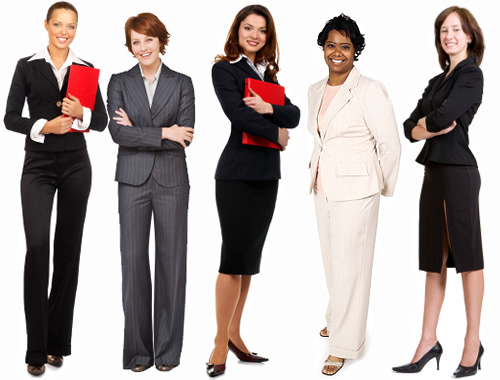 this is an image of a group of business women. business women become their own subculture because they dress in a way that reads more conservate as opposed to an editor for vogue magazine. they are seen as a sea of women in a crowd often appearing to have similar outfits: pencil skirts or slacks.